The Elwood Vol. 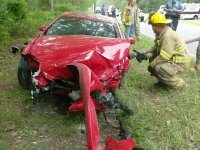 Fire Company was called to a one car Motor Vehicle Accident (MVA) on Moss Mill Rd & Skyes ave on June 15th at 8:13am. Engine 16-3 responded with a crew of 4 and Rescue 16-4 also responded with a crew of 4. On arrival at 8:18am the crews cut the battery cables & hosed down the engine compartment. One person was transported to Kessler Hospital by Hammonton Rescue. All units were clear at 8:36am. 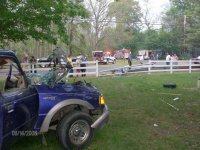 The Elwood Fire Company was called to Moores Ave & Chestnut Rd for an overturned vehicle on June 14th at 6:58pm. Rescue 16-4 responded with a full crew of 4. Engine 16-3 with a crew of 5. 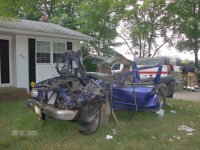 On arrival at 7:08pm R-16-4 used the jaws of life to remove the door and free the driver. Engine 16-3 landed the helicopter while Nesco's pumper stood by with a charged hand line. All units we clear at 7:50pm. 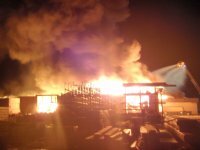 It was one of the largest fires in Atlantic County since the Wheaton Fire in Mays Landing. 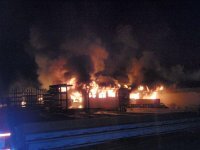 Universal Supply Lumber and Kitchen division caught fire shortly after 11:30pm on Firday May 30th. The Elwood Fire Company was called at 11:57pm. On arrival Engine-16-3 was put into service as well as Tanker-16-5. The fire was though the roof on arrival. Fire companies were called from all over Atlantic county as well as Camden, Gloucester, Burlington and Cumberland counties. The tanker task force was called in bringing tankers from all over South Jersey. Tanker 16-5 made 15 shuttle loads of water though out the night. Elwood firefighters stayed on location untill 11:30am the following morning helping with overhaul and clean up. Chief Anthony Tomasco would like to thank all those Elwood firefighters who came out and worked though the night for over 12hrs to fight this fire. Hammonton's Chief, Mike Ruberton, also expresses appreciation to the Elwood Fire Company for their hard work and long hours. Click "read more" for news paper articles. Engine 16-3 responded with a crew of 3 and found a small brush fire that was put out with a hose.